Upgrades include community cat rooms, electronic display screens, upgraded dog runs and a pet drop-off office separate from the lobby. It was about one year ago when Burlington County officials broke ground on a 2,400 square-foot expansion project at the Burlington County Animal Shelter. With that expansion now officially completed and unveiled to the public several weeks ago, residents who’ve recently visited the shelter have been introduced to upgrades such as three new community cat rooms, new electronic display screens, upgraded dog runs and a new pet drop-off office at the back of the shelter, separate from the main lobby. When the county first announced the upgrades last year, Burlington County Freeholder Director Bruce Garganio said the project was expected to reduce stress levels for animals at the shelter and give visitors a more comfortable experience. According to Daisha Pierce, management specialist for the shelter, those expectations are already coming true. Speaking about the three new community cat rooms, where up to 10 cats at a time can leave their cages and interact with one another, Pierce said she and staff have already seen cats more relaxed than when kept in their cages, which Pierce said can be noisy and unsettling for some animals. While metal cages can help shelters more easily disinfect areas and keep their animals healthy, Pierce said the new cat rooms would also keep cats healthy by letting them relieve stress and reduce their anxiety. Pierce said the room also allows visitors to view the cats in an area more cheerful than a room with cages where the potential adopter might be more comfortable. “It’s sort of a 50–50 win for the animals and the people,” Pierce said. Pierce said the shelter is also hoping to apply that same logic to its new dog runs, which have replaced metal gates with smooth walls and glass doors. According to Pierce, some dogs can become agitated when people try to come near cage-like barriers, as it reminds the dog of when they might have been in a home and strangers were getting close to what the animals viewed as their personal space. With these new kennels, Pierce said people could approach the dogs without making them apprehensive and causing them to exhibit unwanted behavior. “We’ve seen a difference already with some of the dogs that don’t do well with the gated door,” Pierce said. 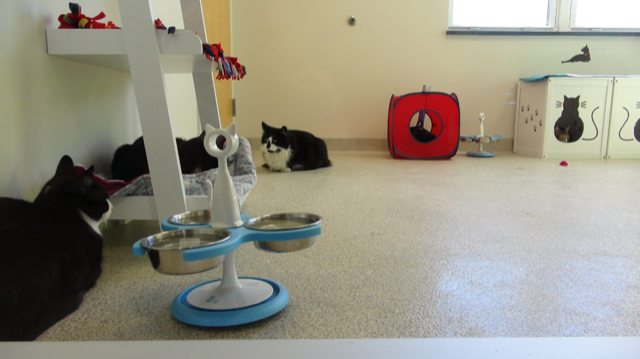 Similar to the new cat rooms, Pierce said the area was also more cheerful and approachable to visitors, who previously might have been saddened by metal cages. Pierce said the upgrades have provided electronic display screens when people enter the shelter where the shelter can display information such as hours of operation, adoption fees, frequently asked questions and more. Pierce said the screens also could display photos of positive adoptions or happy adoption stories. “If you’re waiting to be taken care of in the lobby, you can just use those monitors to learn more,” Pierce said. In addition to helping those looking to adopt a new pet, Pierce said the upgrades also serve those looking to leave an animal with the shelter’s new drop-off area, which is now a separate entry in the back of the shelter. Pierce said previously those leaving animals would wait in the lobby with those looking to adopt, leading to confusion. With the new area, shelter staff can talk with those leaving animals in a more personal setting, especially since those leaving animals might be going through difficult situations, such as losing a job or being evicted. “We have an easier time having a more in-depth conversation and provide resources and support,” Pierce said. Upon unveiling all the new upgrades in mid-October, Garganio said he and his fellow freeholders were thrilled to share the expansion with the community. Pierce also thanked Garganio and the freeholders for their support. “They really listened to us and wanted to know what we thought would make a high impact at the shelter, and they’ve been tremendously supportive in making this all happen,” Pierce said. The Burlington County Animal Shelter is located at 35 Academy Drive in Westampton, behind the Burlington County Library. The shelter is open noon to 4 p.m. every day except Thursday, when it is open noon to 7 p.m.
For more information, call (609) 265–5073 or visit www.co.burlington.nj.us/168/Animal-Shelter.